#GNAUniversity hosted an #Inter #College #Competition, Kshitiz 2017 students Participated in various #events like #Biz #Quiz, #Ad #Mad #Show, #Code #Craze, #Bug #Debug, #Treasure #Hunt, #LAN #Gaming, #Web #Designing, #Logo Designing, #Beyond the Lens. 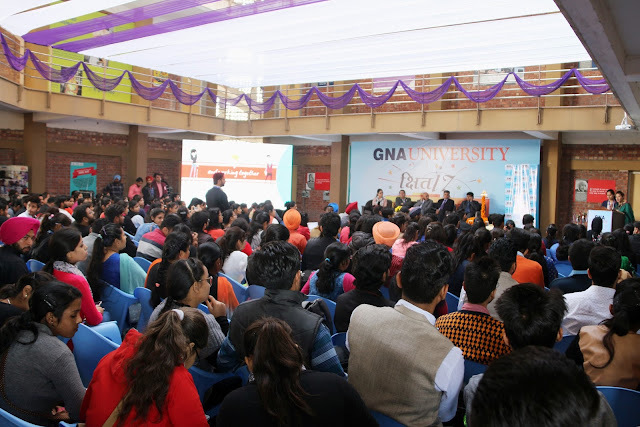 The event was #inaugurated with the blessings of S. Gursaran Singh, #Chancellor, #GNAUniversity. PCTE Collage Badowal scored 1st #position in Ad Mad show & Trinity College earned second position in Ad Mad show. GNA University bagged 1st position in Code Craze, Logo Designing & Bagged the Lens Competition where CT Institute scored 2nd position in Code Craze, DAV University 2nd position in Logo Designing & DAV College Hoshiarpur second position in Beyond the Lens event.